Nope - I haven't a clue either, and I've had enough conflicting advice to convince me we need a test, so I've set one up. I've used an offcut of pale iroko, and from the left I have 3 coats of Osmo UV Oil, then one coat of Sikkens Cetol HLS Plus light oak stain covered by 3 coats of UV oil, and finally on the right one coat of Sikkens Cetol HLS Plus light oak stain followed by 3 coats of Sikkens Cetol Filter 7 plus light oak. The test piece is out in the open facing due south in full sun so we'll see what happens. I'll update the thread at approx 6 month intervals, or when I remember or when asked. Hi Roger, Like you Ive had so much conflicting advice from paint reps so I'm pretty sure none of them know.The worrying bit is we all reply on the paint reps/companies for advice and if it goes t*ts up I have no confidence in them sorting it out. Ive used Sikkens Cetol HLS followed by Filter 7 and was pretty impressed but prefer the natural look of Oak opposed to a stained finish .I've never used Osmo UV oil so do you need to use a pigmented stain with it for UV colour protection? if you used solely Osmo oil would the natural colour fade ?..I would think the Tanic acid in Oak would be a problem whereas Iroko would be ok.
Well, so far as iroko is concerned we'll find out won't we! The reason I've used a pale oak stain under the UV oil in the middle section is to see whether the stain makes any difference. I also prefer the natural wood, but suspect that some pigment is needed to enhance the UV protection. It'll be interesting to see. I look forward to seeing how it progresses. All 3 seem to be standing up well. Predictably, the wood has darkened so that the difference between the far left and the centre panel is less marked, but all seems fine so far. The test piece has been in full sun and open to the weather. They are all standing up well. However, as you can see, there is very little difference between the UV oil over the stain compared with the UV oil on its own. 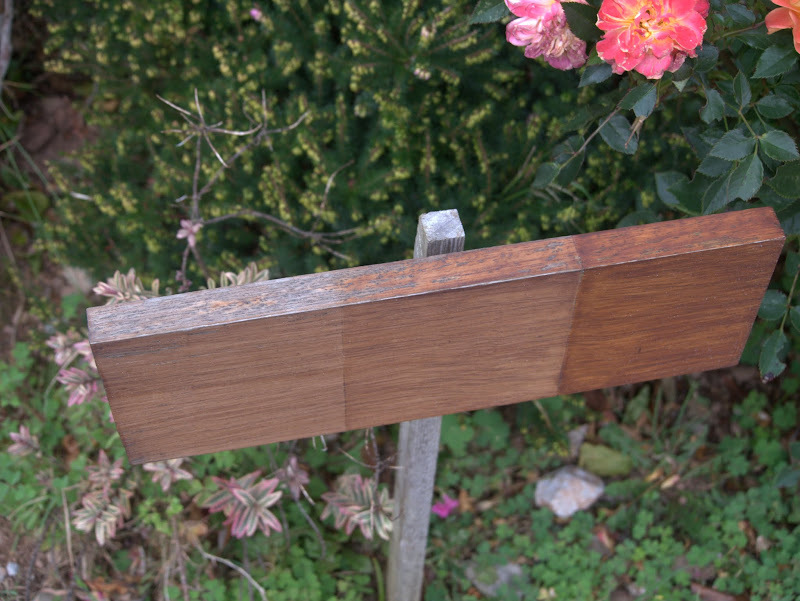 There is a narrow line of grey along the top edge which may be due to UV getting to the wood from both sides near the edge. The Sikkens is still looking solid and if this were joinery I wouldn't feel the need to repaint yet. The position remains facing due south in full sun. I don't think that if you are using iroko you'll need preservative. So far, based on a combination of this test and some iroko doors and windows, I would stick with the light oak stain under Sikkens Filter 7. But time will tell! Getting a bit scruffier! Now nearly 2 years old - including 2 summers. The section of the left which is just 3 coats of UV oil is showing severe breakdown along the top of the specimen, and it's starting to show signs of grey along the front as well. The centre section, which is one coat of Sikkens Cetol HLS Plus light oak stain covered by 3 coats of UV oil is slightly better, which seems to indicate that a bit of pigment does help, which is hardly surprising given that sunglasses help as well. Finally the one on the right has one coat of Sikkens Cetol HLS Plus light oak stain followed by 3 coats of Sikkens Cetol Filter 7 Plus (light oak), and this is still holding up well. There is slight greying along the front edge, but the front face and top is generally looking good. I reckon that if I had chamfered the edge, or rounded it slightly that would have held up as well. Ignore the white spots - back in the summer some idiot sprayed his kitchen doors nearby and the overspray drifted over the test piece. Incidently, the back of the speciment which was treated in exactly the same way and is in the shade, is pristine, and it is slightly disappointing that a product that is marketed specifically as UV Protection has come out the worst. Whilst Osmo would probably claim with some justification that this is not a scientifically controlled test, and one specimen is not enough, this IS a real world test based on how people actually use the product in real life. Excellent thread, thanks. Very useful. I very much like the tone of the middle plank. Looks like its holding up pretty well also. Think i'll use this combo on an oak job coming up. Louis84 wrote: I very much like the tone of the middle plank. Looks like its holding up pretty well also. Think i'll use this combo on an oak job coming up. On your own head be it Louis. Remember that this was a test purely to compare 2 different finishes on iroko. These results will not necessarily be the same on oak. I'm planning a test to be more comprehensive comparing 5 or 6 finishes on iroko, sapele, oak, idigbo, and douglas fir, which will hopefully be more representative. Nice, well I look forward lynching more of your research and making the world a more durable place! Hows it looking after all the insane weather as of late? No change from the photos above taken about 2 weeks ago. The back of the piece is as good as new. What is clear is that it is sun that is the real problem, not wet weather. Roger-M wrote: No change from the photos above taken about 2 weeks ago. The back of the piece is as good as new. What is clear is that it is sun that is the real problem, not wet weather. What an interesting thread, thanks for posting such detailed information. I've signed up to the forum just to comment on it. 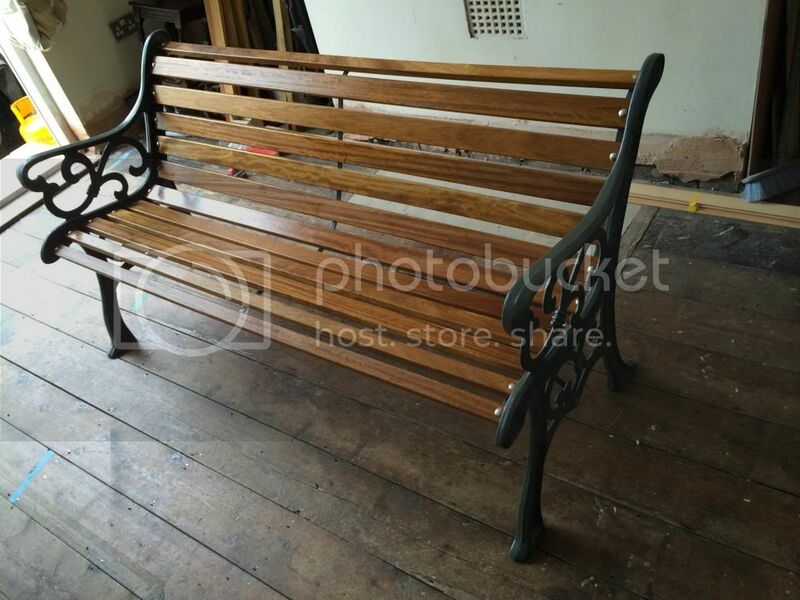 I'm having the metal shot blasted and powder coated and have just taken delivery of some Iroko I have had machined down by the timber merchant. 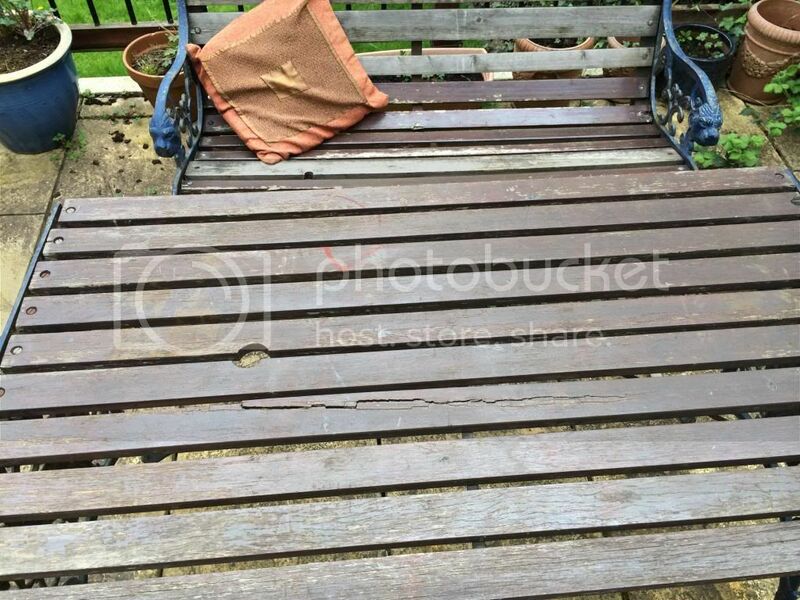 Having come across this thread I was tempted to use the Sikkens Cetol range, however, I've recently used it on a timber railing kit I'm not sure how well it would fair on garden furniture which will take a lot of abuse - I imagine the top coat would scratch and need a lot of maintenance. Most people I've spoken to have advised me to accept that the timber will go grey/silver and embrace it. However I'm not a fan of this look and would like to keep the timber looking fresh. With this in mind, I've decided on applying either Osmo UV oil or Deks Olje D1 oil. I was thinking of applying a wood preserver first, either a clear or light brown colour (I have some Barrentine in my garage). Do you think this is worthwhile, and will a coloured dye/preserver help defend against UV? Thanks for the comments Dave. I started the thread in frustration at not being able to find a definitive answer for some iroko windows and bifold doors I've built . This test is valid only for iroko - I've no idea how various finishes last on other timbers, but I'm planning a larger test involving more finishes and a variety of timbers which may be used for external work. So far as this test is concerned, the worst result so far by a significant margin is from the osmo UV Oil used on its own. The best result by far is from the Sikkens Cetol HLS Plus light oak stain followed by 3 coats of Sikkens Cetol Filter 7 Plus (light oak). Obviously Sikkens do other colours - it's just that this was the one that gave the colour I wanted. What is clear is that it is sunlight that causes the damage - the reverse side of the test piece is in shade and all finishes are still in first class condition. Horizontal surfaces seem to fair far worse than vertical ones - presumably because they have more exposure to the sun when it is at its strongest. This would clearly affect your garden seat. I tried Deks Olje D1 oil on a piece of oak some time ago, and it didn't fair at all well, although I haven't tried it on iroko. However, a neighbour who has used it on teak on his boat swears by it, and it's true that the teak is looking remarkably good. Perhaps I need to include the Deks Olje D1 oil on various timbers in my forthcoming multi timber/multi finish test. Whatever you use, I think something with pigment in it is essential for UV protection for the same reason that clear sunglasses don't do a lot! 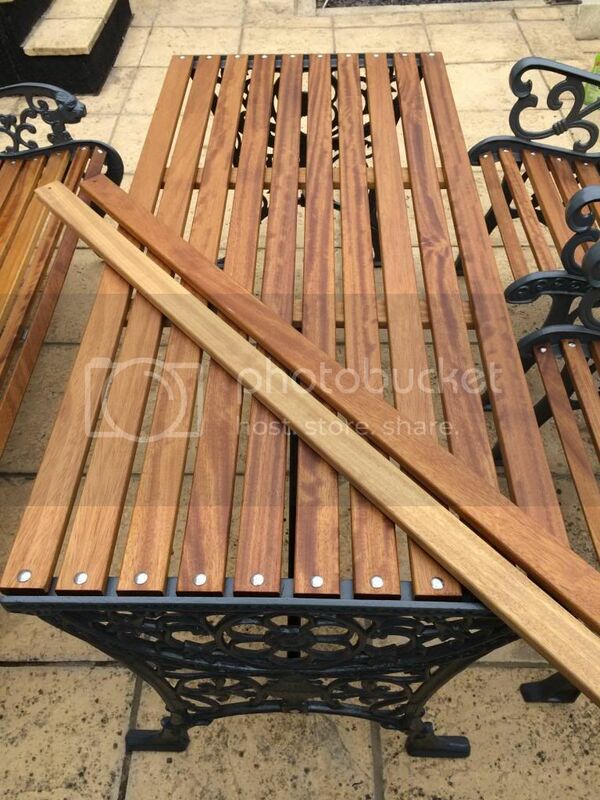 For a garden seat I think I would also accept that it will go grey and simply treat it periodically with teak oil. If you go down the Sikkens route i think you need to be prepared to re-coat it every 2 years. Can I add the pigment for UV protection via another method, either a dye/preserver or maybe even a tinted oil? I'd prefer to use something that would soak in to the wood rather than sit on top of it. Possible, but the surface seems pretty hard. No problems with it on my external doors. Can't help feeling that if it was that easy the paint producers would already have done it. A horizontal surface in full sun is going to take a hammering no matter what you use. You'll have to get used to painting it every other year. Yep - that's what I've done so far as garden furniture is concerned. Thanks Roger, I think i'll just oil it and let nature take it's course. I'll post back with some pictures of how it looks over the next few months. 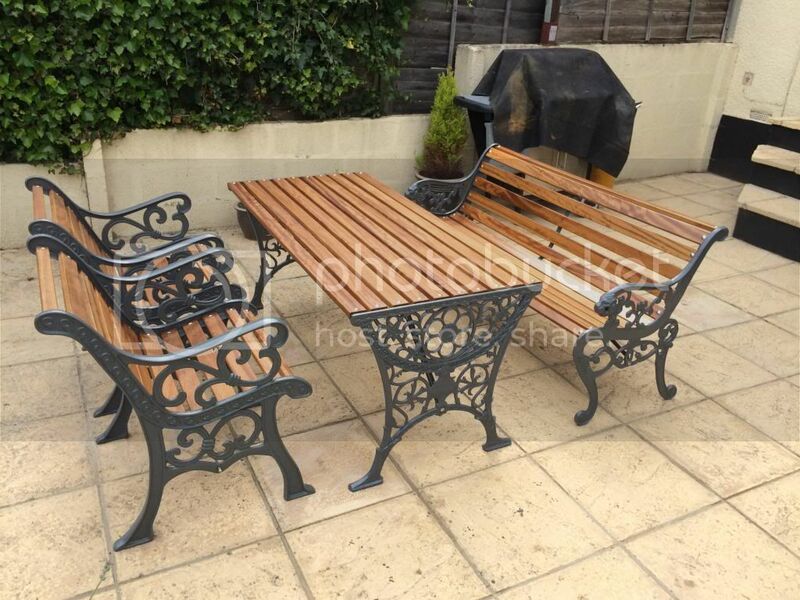 So I've finally managed to assemble all of the garden furniture. As you can see, it looks a warmer more golden colour with the Oil. I'll report back to show how it holds up! That looks very smart, I have a similar job to do myself if I can find the time. Yes, me too. Except I'm allergic to Iroko. woodsmith wrote: That looks very smart, I have a similar job to do myself if I can find the time. Thanks. It was very time consuming putting it all back together and ensuring it was all square etc...but it should now last a very long time. Four years ago, we renovated our home and fitted new iroko doors and windows throughout. They were treated with Cetol Bl31. they were peeling and it looks now as though there is mould growing in the stain and also horrible water marks. i contacted dulux. when i said we had been recommended by the joiner to use cetol bl 31 the reply was " i don't know why they would recommend that its water based for iroko you need solvent based hls plu and then filter 7.... or novatec and novatop..... i was unsure. i spoke to other owners of iroko windows and decided to get some hls and filter 7 (light oak) . when i have sanded back one set of doors to remove the black mould and the tidemarks (which are in the stain) all looked good. however... when ive then brushed on hls the iroko has turned bright red in patches it looks horrible!! Help! im thinking now i should just have bought some more cetol bl31 even though ive been recommended the solvent one.... but ive double checked on the dulux website and it says exceptions for novatec and novatop not suitable on oily woods such as iroko!! so do they know what they are talking about??? I'm gutted ... we have 5 sets of French doors, 20 odd windows and a front door!! What can i do? i just want our lovely wood windows to look beautiful like wood!? This piece has been in full sun and salty wind ( we live on the coast) for 2 1/2 years now. This is the end of the 3rd summer. The left side (3 coats of Osmo UV Oil) is faring worst, particularly the top edge, where not only has the wood discoloured, but the finish is peeling. The centre panel (one coat of Sikkens Cetol HLS Plus light oak stain covered by 3 coats of UV oil) seems to be holding up a little better. By far the best though is the right panel (one coat of Sikkens Cetol HLS Plus light oak stain followed by 3 coats of Sikkens Cetol Filter 7 plus light oak). Whilst this is beginning to show signs that it is weathering, I think it will probably last another summer before it would need repainting if it were a piece of joinery. However, I'll just leave it to continue weathering to see how it lasts. Ignore the white spots on the front of the piece. Some dipstick sprayed his kitchen doors on the driveway and the overspray drifted onto it! fabulous post. How is it looking now. I am replacing teak on my boat with Iroko and this post has led me to the course of action I think will give the longest lasting protection. Can't believe it's 17 months since I reviewed this. This test piece has now been exposed to the weather for exactly 4 years. The left side - 3 coats of Osmo UV Oil has continued to deteriorate and there is little sign of any protection left. The centre panel (one coat of Sikkens Cetol HLS Plus light oak stain covered by 3 coats of UV oil) seems to be holding up a little better, which demonstrates that you do get some extra UV protection from pigment. The best though is the right panel (one coat of Sikkens Cetol HLS Plus light oak stain followed by 3 coats of Sikkens Cetol Filter 7 plus light oak). The vertical part is remarkably good, although the top/horizontal edge is showing signs of weather. After 4 years in a salty environment facing south in a particularly sunny spot, this is hardly surprising and if it was external joinery I would be redoing it this year. It case there is any doubt as to whether it is the sun that is doing the damage, I've also posted a pic of the back of the piece which is in permanent bright shade, and none of the finishes have been affected to any noticeable extent. 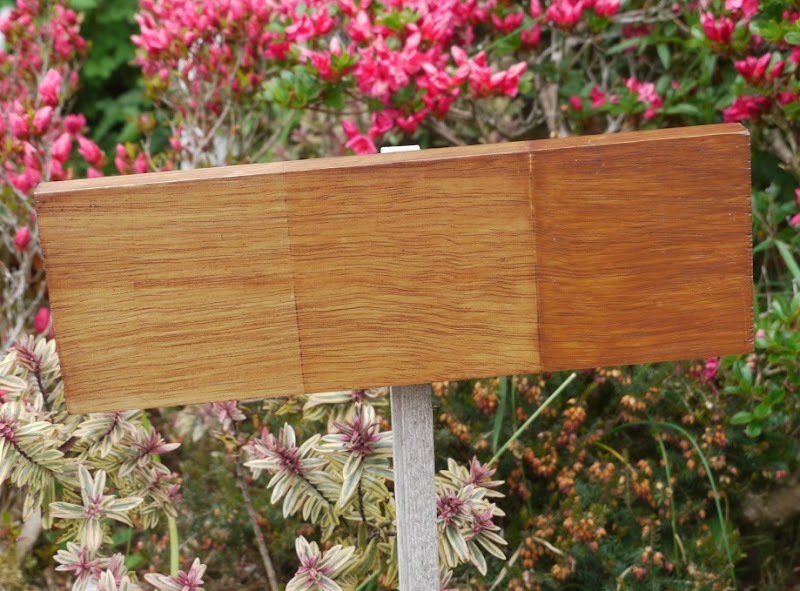 This is the same Sikkens finish on a sapele post box which gets full sun for half the day, applied about a year ago. No sign of any degradation yet. I have stumbled across this thread searching the internet for advice and have been following it with much interest. I have an Iroko side gate which was supplied new last year with a finish. Starting to think about how I will go about refinishing it in the future. I spoke to the manufacturer today who advised that the factory finish was Osmo. I asked the customer services guy Osmo what? expecting to be told either woodstain or oil but he said wax. I was surprised because the Osmo internet site seems to suggests wax is for interior wood. I could not get any more detail from him. I quite like the look of the Sikkens woodstain used in the comparative test above but the data sheets for it suggest that it should not be applied over waxes and oils. If when the time comes to refinish will sanding the gate down allow me to use any finish of my choosing? The inside of the gate gets full sun until around 2pm and the sea is fairly close by. Hi Moo, and welcome to the forum. This is a difficult one. Iroko is an oily wood anyway, which largely accounts for its durability. I am a great fan of Osmo PolyX oil for bomb proof internal applications, but it's not suitable for external joinery. All their waxes are for internal use only. A quick trawl through the Osmo website shows that for a translucent natural finish they recommend UV Oil, which as I recall is why I set up the test shown here. I must emphasise that this is not a scientifically valid test - just a test by a keen DIYer using one type of timber in a single location using products I already had on the shelf. I did however take great care to apply the test finishes exactly according to the instructions, and I guess this gives it a "real world" authenticity, if not a scientifically controlled one. My guess is that they used an oil finish. I suspect that when fully weathered and sanded you will be able to cover it with any finish you want, but that's just my partially informed opinion. There is some evidence to show that pigmented finishes are more durable in a high UV environment, which is of course what sunglasses do, so it should come as no surprise. The UV oil over a pale pigment has lasted better than UV oil on its own, but nowhere near as well as the pigmented Sikkens over the same stain. 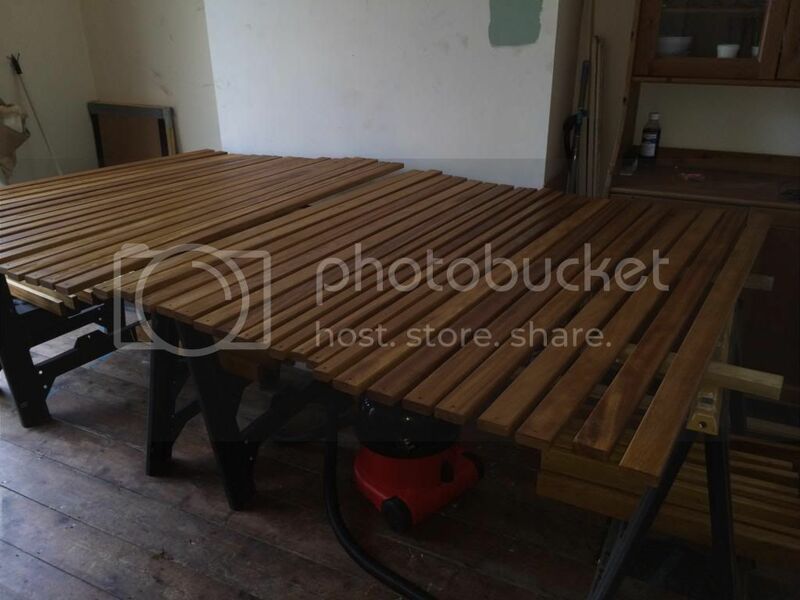 Horizontal surfaces also fair less well than vertical ones, and the Sikkens guidance notes say that it is not recommended for horizontal surfaces, which rules it out for a forthcoming patio table project. 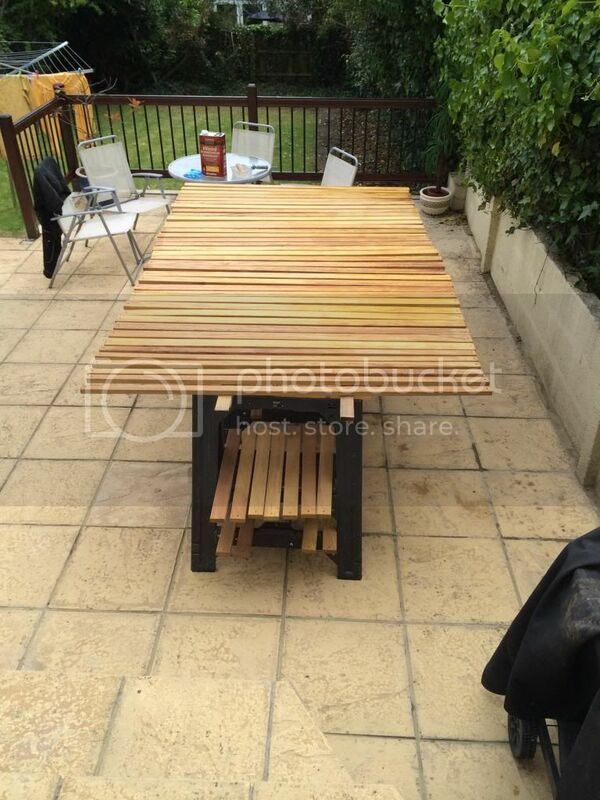 You could just use teak oil or UV Oil and accept that the wood will weather to a dark grey colour. I built some garden gates for my mum in tanalised softwood and painted them with a walnut pigmented Sadolin Classic. This has also lasted very well. Ideally I need to set up a comparison now between Sikkens and Sadolin, using the same shade of pigment in each case, to see which lasts best on both softwood and Iroko, plus maybe oak and Sapele, to cover the most frequently used timbers for external joinery. Thanks for the reply. Whatever they used is wearing pretty quick! The tops of the gate and the posts are grey already. Definitely want colour and tbh not too bothered about having to do it every year so maybe oil is the way to go. This video from Sadolin is worth a view. I think a test of Sikkens vs Sadolin Classic and Extra vs Sadolin Ultra (base and top coat) could be interesting. I thought I'd report back after my experience of the Osmo UV oil. I'll have to get some pictures up, but in short - i've been extremely disappointed. The Iroko table show signs of silvering after a matter of months, even with a few coats of the Osmo UV oil. I guess it's to be expected as it takes a UV battering pretty much all day until 5-6pm when the sun moves over the house. I'm not holding out too much hope, but if this doesn't work I'll bite the bullet and use a woodstain such as the Sadolin Ultra which features in the video which Roger posted above. Or just build a Pergola ?! Anyone who has found this thread useful may be interested in the new one I've just posted that compares Sadolin Ultra vs Sadolin Classic vs Sikkens Cetol Filter 7 Plus. Are the originals still going Roger?